Which bedroom tribe do you belong to? Claim FREE tickets to A Place in the Sun Live! 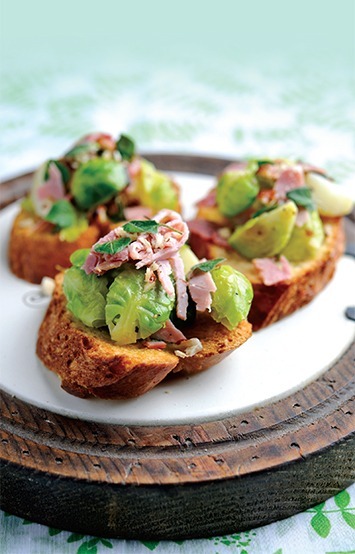 Steam the Brussels sprout pieces in a double boiler till quite soft, but still bright green. Place on a clean food tray, to spread out and stop the steaming. Set aside. Take a heavy sauté pan, heat some oil and gently sweat the garlic and onion until soft. Add some salt and a little water to allow the garlic to steam slowly. When the vegetables are soft, add the chopped hazelnuts, the potato pieces and the ham. Mix well. Add the soft Brussel sprouts. Taste for seasoning, adding more sea salt and pepper if you want to. Then place a lid on the pan, and set aside somewhere warm. Take the four slices of bread, drizzle with a little olive oil on both sides, and toast under the grill. Alternatively, you can just toast the bread without olive oil in a normal toaster, and then drizzle a little olive oil on top. Place a toasted bread slice on each of four serving plates. Spoon the Brussels sprout mixture on top, generously. Sprinkle on the grated Parmiggiano Reggiano and oregano on top and serve. If you enjoyed reading this, you'll love a subscription to Northern Life magazine. This coconut water is king! At Northern Life we’re always working to improve our fabulous magazine for you. We would very much appreciate your feedback with the below questionnaire. In return we are giving five lucky readers a FREE Northern Life subscription! To be in with a chance of winning and to help us with our quest for perfection please fill in the questionnaire below. Where did you purchase your copy of Northern Life? What do you like about Northern Life? What do you not like about Northern Life? What would you like to see more of in Northern Life? Is there anything you’d like less of? How far would you travel for goods and services ie. a restaurant, a new bed, beauty treatments? Welcome to NorthernLife magazine, the only magazine ‘that bridges the gap’ between Lancashire and Yorkshire, providing the perfect advertising platform for you to reach and attract more customers. Published every two months NorthernLife continues to captivate the north with its loyal army of readers. Celebrating northern culture and heritage, NorthernLife is unlike other local lifestyle publications and is a magazine for the people by the people, reflecting the wealth of talent the north has to offer. Firmly established as the north’s most informative and essential read, NorthernLife is firmly becoming the north’s favourite read. The latest articles, competitions and offers direct to your inbox. We promise we won't bombard you!